Over the top? The Fujitsu Stylistic Q702 wants to be the multi-talent in the office. The concept is versatile in every way: it can be used as a tablet or a notebook, features touch operation with fingers or a pen and has a keyboard dock. 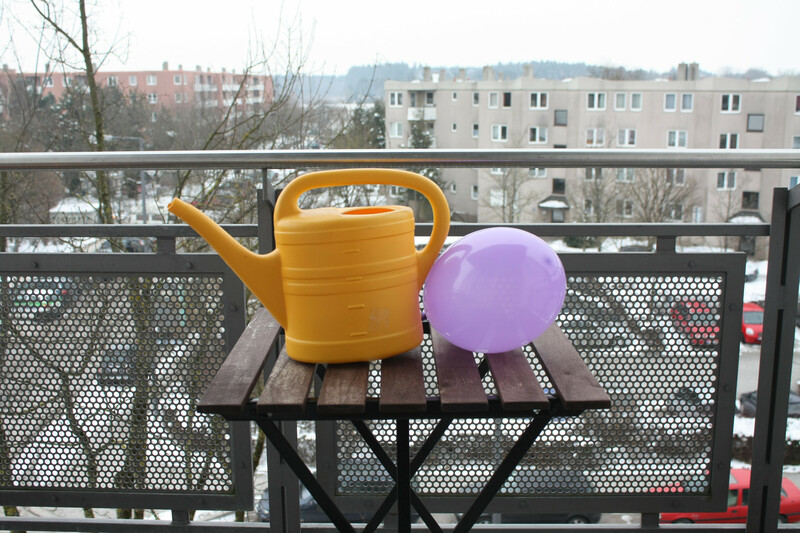 Our review reveals whether this design proves useful in daily tasks. 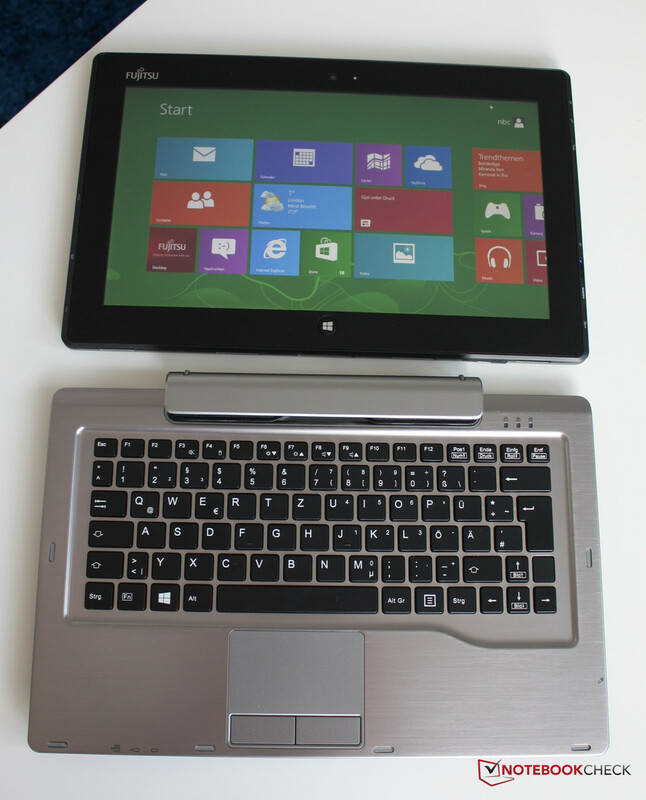 The Fujitsu Stylistic Q702 is based on a convertible concept, namely the combination of a tablet and a keyboard dock, with the help of which the tablet quickly turns into a notebook. 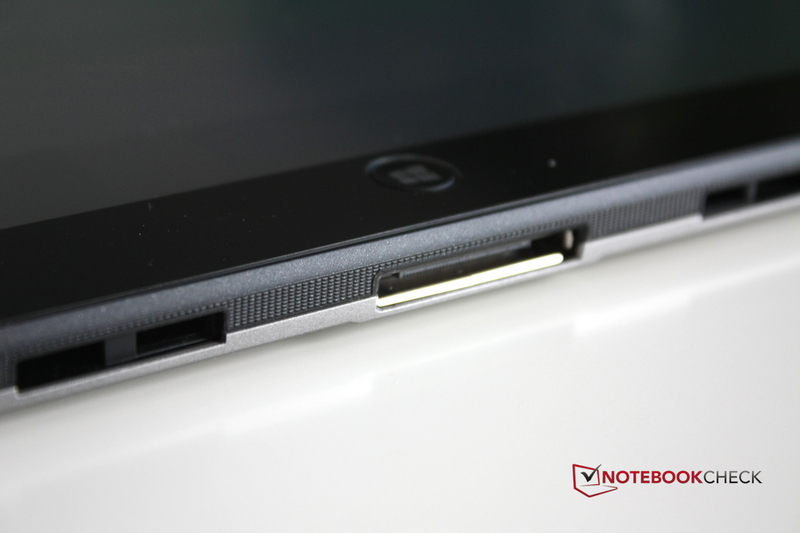 The tablet is simply locked into the dock and then serves as a display. Input is then possible via both the touchscreen and the keyboard. This is especially practical for office use, where the mobility of the tablet is appreciated, but a keyboard and a mouse are often easier to work with. 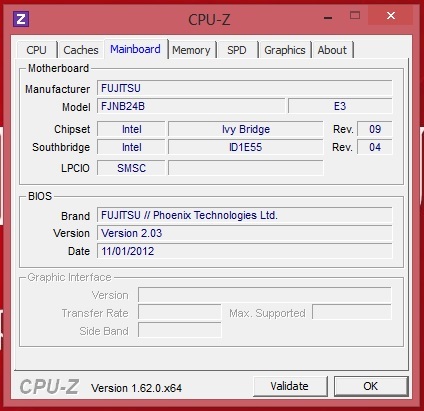 In terms of hardware, the Fujitsu Stylistic Q702 offers various Intel Core i3 and Core i5 processors, as well as systems with Intel's vPro technology that is suited mostly for the needs of corporations. The graphics chip is Intel HD Graphics 4000, which has enough power for office work and watching movies. The data storage is taken care of by an SSD or built-in flash memory, both of which are faster than conventional hard drives, use less energy, and hardly make any mechanical noises. For mobile communications, a WWAN module with a GPS sensor can be installed, as was on our test unit. So far, it sounds like an all-round package for the business sector, which can also be configured and adapted to the diverse needs of the specific users. However, this comes at a price: firms or interested private users must pay between 1300 and 1800 Euros (~$1724 to $2387) for the Stylistic Q702. But then most IT departments would question whether a 700 Euro (~$928) Fujitsu LifeBook would not be enough for the usual office tasks. If you like the concept, the business class currently offers a number of alternatives. 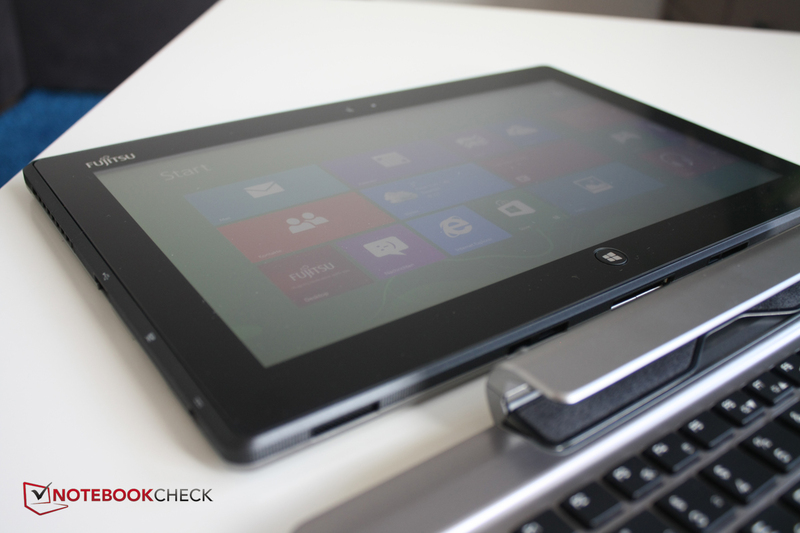 Dell has the Latitude XT3 and the XPS 12, although the keyboard cannot be removed in either device, but only rotated so that the display is used as a tablet. 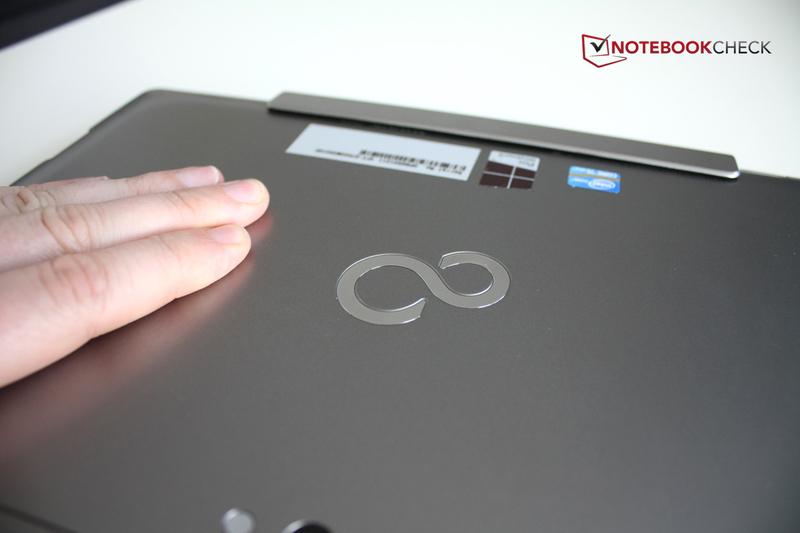 Lenovo's ThinkPad Twist also utilizes flexible hinges instead of a detachable tablet. Sony offers a similar concept for the Vaio Duo 11. Samsung's slightly older Series 7 XE700T1A-H01DE is a bit different - it is the only completely detachable professional tablet with a keyboard dock. Different materials and design for the tablet and the keyboard dock. 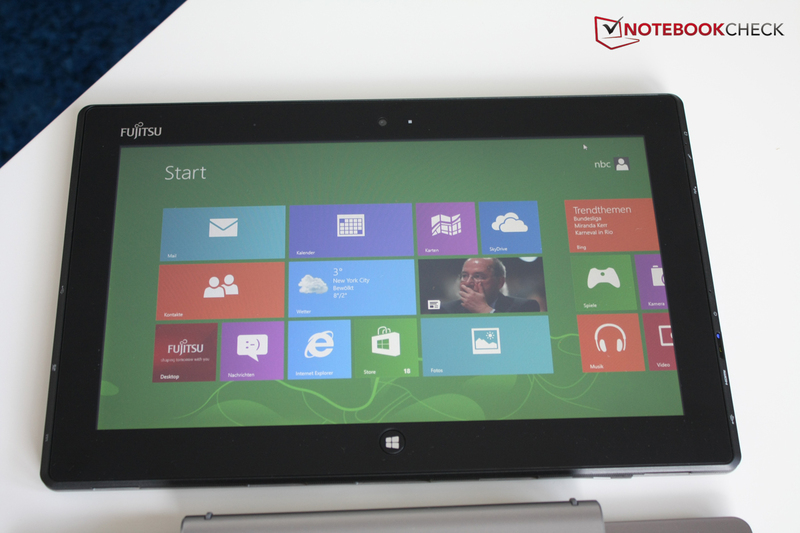 Compared to other tablets, the Fujitsu Stylistic Q702 looks a bit bulky. But after all, we have an Intel Core i5 Processor integrated, while most other tablets rely on weaker Nvidia Tegra or Intel Atom systems. The dimensions of the device are fine in view of the performance, since all the relevant components are installed in the tablet. The dock serves only as a port replicator, an additional battery, and a keyboard. This concept makes the tablet quite heavy. 850 grams (1.87 pounds) without the dock is a bit too much. An iPad weighs 200 grams (0.44 pounds) less. The total weight of 1660 grams (3.66 pounds) with the dock is also much more than the competition - the Sony Vaio Duo weighs 400 grams (0.88 pounds) less. Overall, a lot of metal has been used, as is expected from a high-quality device over the 1300 Euros mark (~$1724). 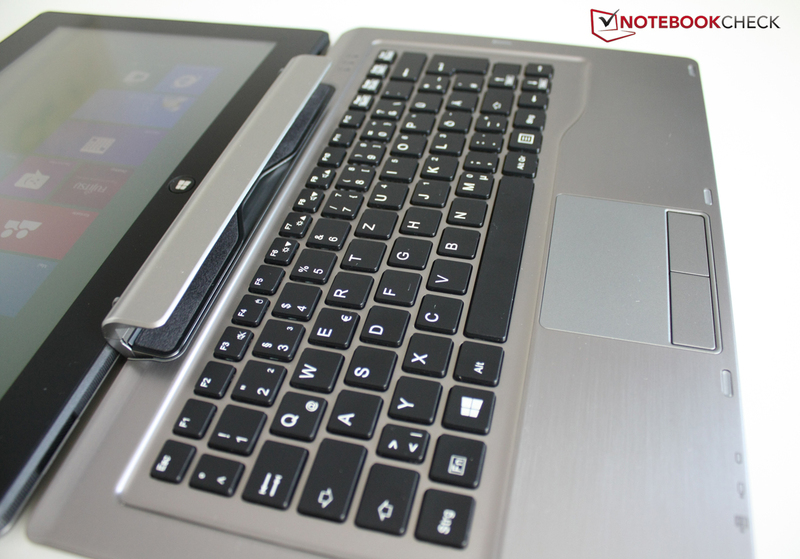 Magnesium and aluminum ensure that the convertible tablet is not too heavy. It is stable throughout, although the magnesium display lid is not as impressive and gives in a couple of millimeters when pushed. 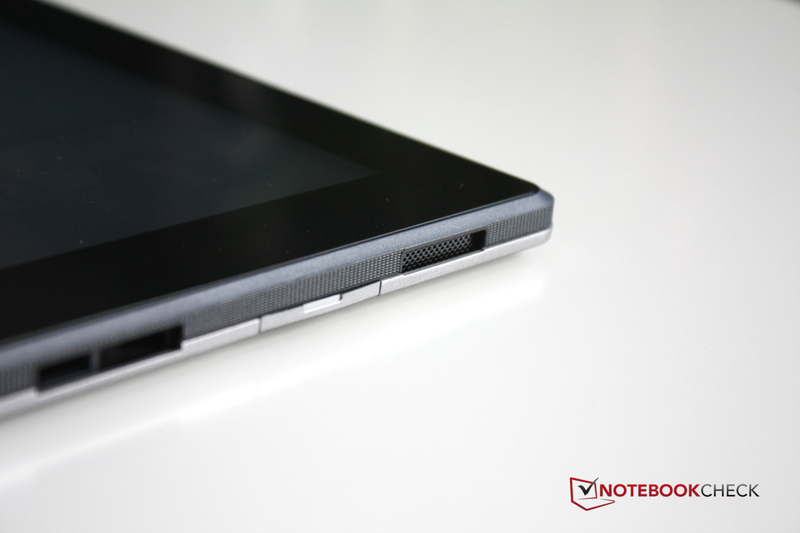 Apart from the silver back cover, the tablet comes mainly in black. Even the wide display bezel is in the same color. The keyboard dock looks even better than the tablet, with its surface made completely out of aluminum and its rounded edges. 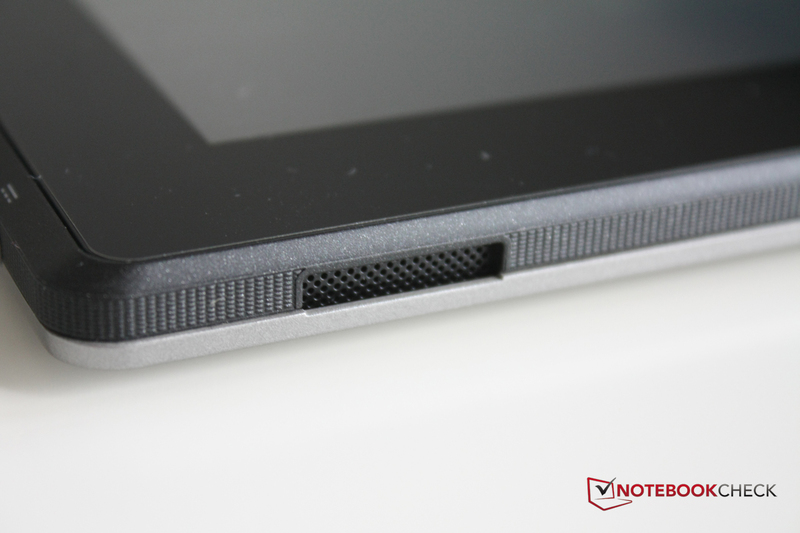 On the other hand, the tablet has sharp edges, which can become uncomfortable during prolonged use. Overall, it is surprising that Fujitsu has chosen a different material, a different finish, and thus a different feel for each of the various surfaces. A more uniform approach would have achieved a higher quality impression. The low tactile difference between the surface of the touchpad and the metallic palm rest is a bit uncomfortable. When the tablet is docked into the keyboard, the fan's rotation is transmitted to the palm rest in the form of slight vibrations, which can be felt with the fingers. The design is a success and "form follows function" comes to mind when we look at the Fujitsu Stylistic Q702. However, there are yet again differences between the tablet and the keyboard dock. The tablet's design, with its wide black display frame, the port openings, and the clean surfaces, is very straightforward, practical and simple. The keyboard dock features details such as a small widening below the arrow keys, the sweeping side line, and the extremely thin front end, making it a bit more elegant, cheerful and overall more emotional. Thanks to its subtle color choice, the Fujitsu Stylistic Q702 can easily fit into any situation or business meeting. However, do not expect any marveling looks from your colleagues, since the design is too uneven and simple. Because of the high-quality materials and the successful details, we award the case the "good" mark. The numerous ports impair the design, but are practical. Although it hurt the score of the "Case" a bit, now it becomes a very positive point for the Fujitsu Stylistic Q702: there are ports (almost) everywhere. 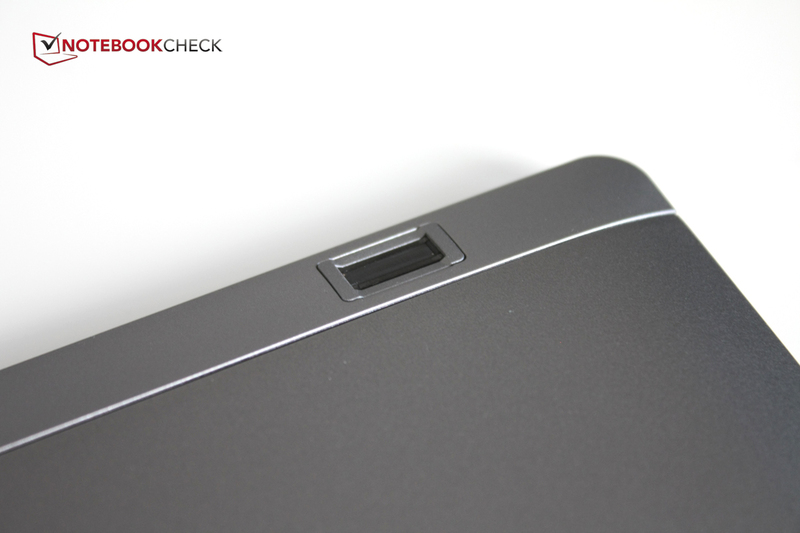 Even if you have only the tablet at hand, it still has two USB ports, of which one is USB 3.0. 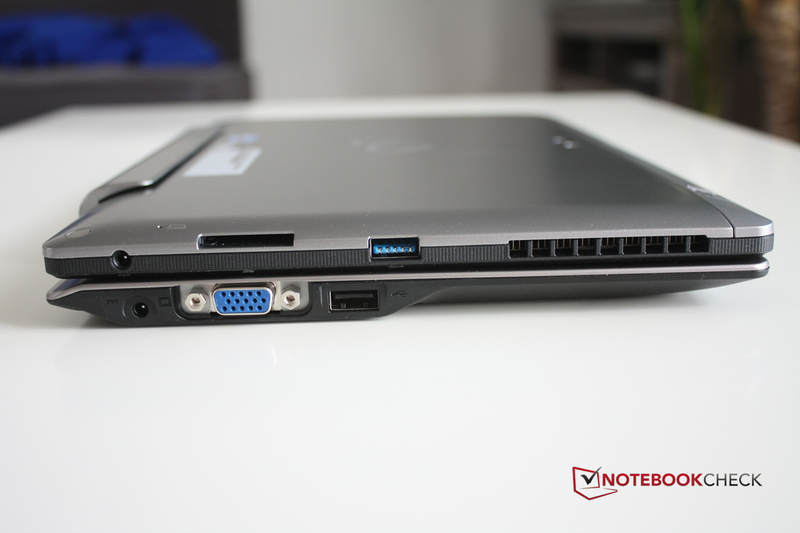 An HDMI port, audio jacks, and a card reader are also on board. 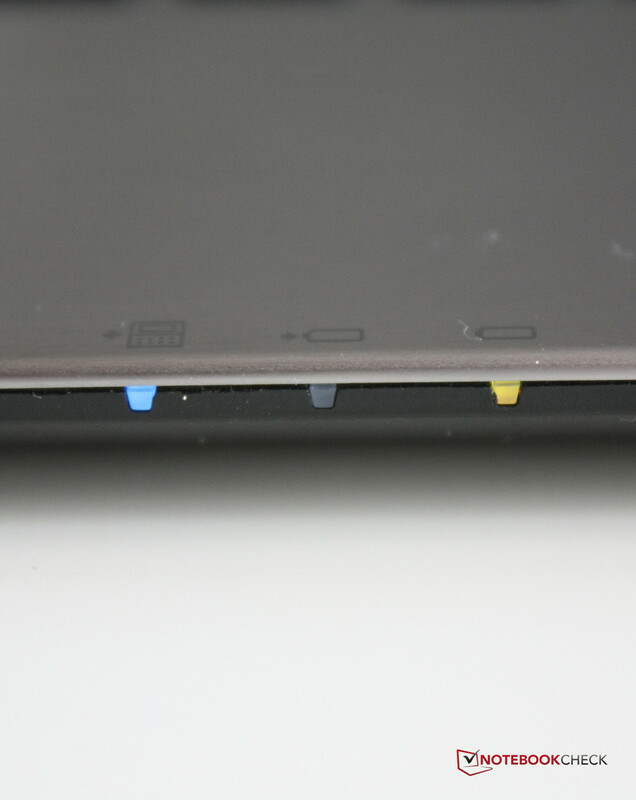 The tablet also has two physical buttons for volume control, as well as ON/OFF, positioning sensor, and WLAN keys. In addition, the tablet is also one of the devices with the most interfaces currently on the market. The competition relies mostly on the keyboard dock to accommodate the ports. 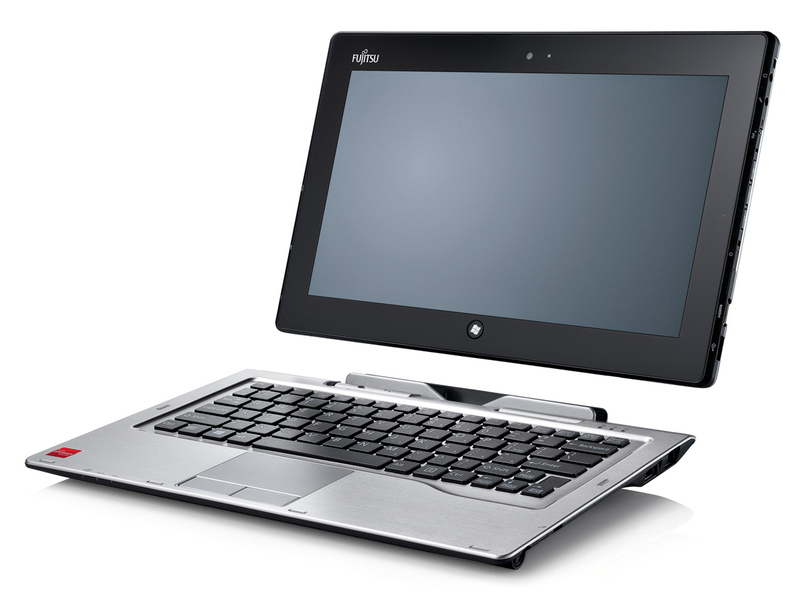 The Fujitsu Stylistic Q702 therefore has an advantage when used purely as a tablet, but is also heavier and bulkier than its rivals. The tablet also features a fingerprint scanner and two webcams, one with a VGA resolution on the inside and one 5 MP camera on the outside. 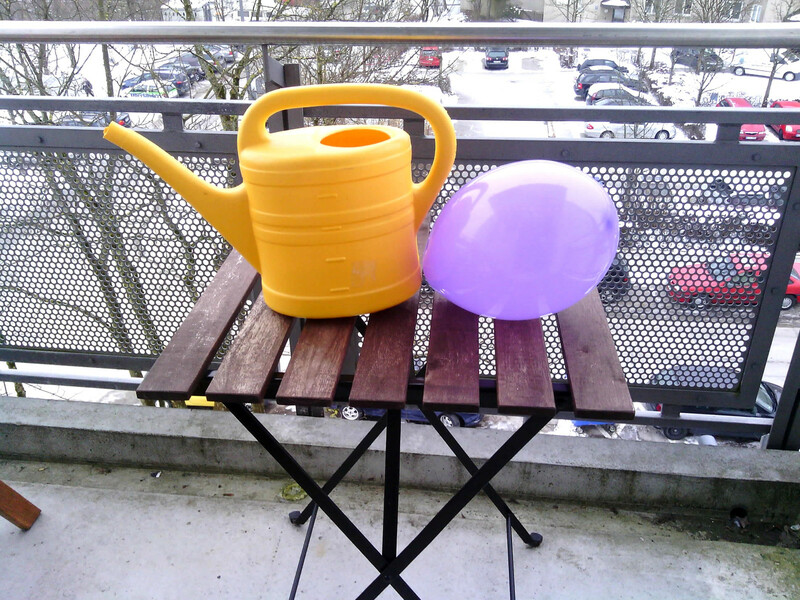 The picture quality of the one on the outside is good, but the inner one lacks resolution. Overall, the combination of the two cameras is very suitable for everyday video calls. When the Fujitsu Stylistic Q702 is docked to the keyboard, a number of additional interfaces become available: a VGA, a LAN, and two more USB ports. A really good idea is the digital pen that is stored in the keyboard dock. When it is needed, a button pushes the pen out. The positioning of the ports is well thought out. Only the audio jacks, located on the upper edge, are a bit disturbing, mainly because when the tablet is docked to the keyboard, the headphone cable often hangs in front of the screen. On the other hand, both left- and right-handed users are completely spared the annoying cables on the sides. Our test unit can really show off in this category: WLAN has been a standard for a very long time now and our model also scores points with full reception bars even at 10 meters (32.8 feet) distance and through three walls. A LAN port that allows Gigabit network connections, Bluetooth 4.0, and a SIM card slot that supports HSDPA+ are also included. Although the newest LTE standard is not supported by our model, it is a configurable option. Completely missing is the NFC (Near Field Communications) standard, which is not yet supported by many devices and it is unknown whether it will become common. Fujitsu is quite generous in terms of security features: a shock sensor and fingerprint scanner are even integrated in the tablet itself. In addition, there is Intel's vPro technology for administrator access to the system, made unusable for example by a virus. 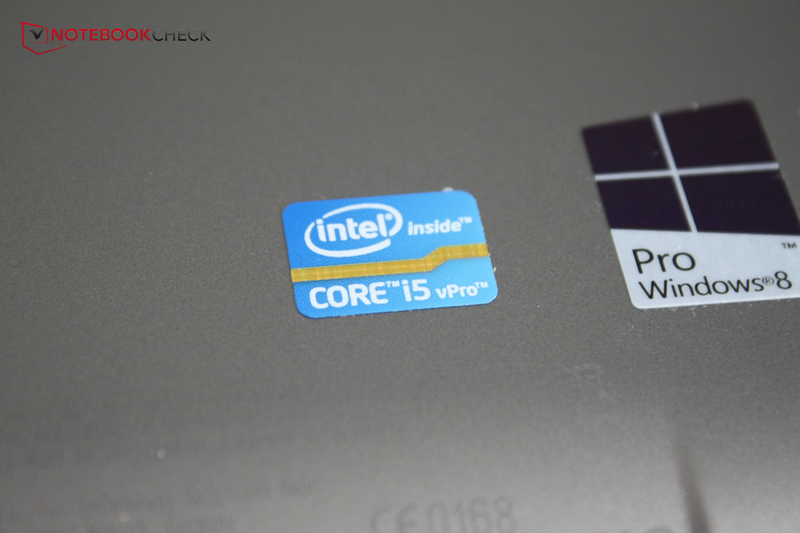 The optional TPM module and Intel's Anti Theft technology will also make companies happy. Overall, Fujitsu offers a number of security and administrative features. 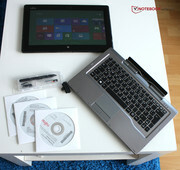 Here, it is slightly ahead of the rivals from Sony and Lenovo, but many of the features are also found on these devices. 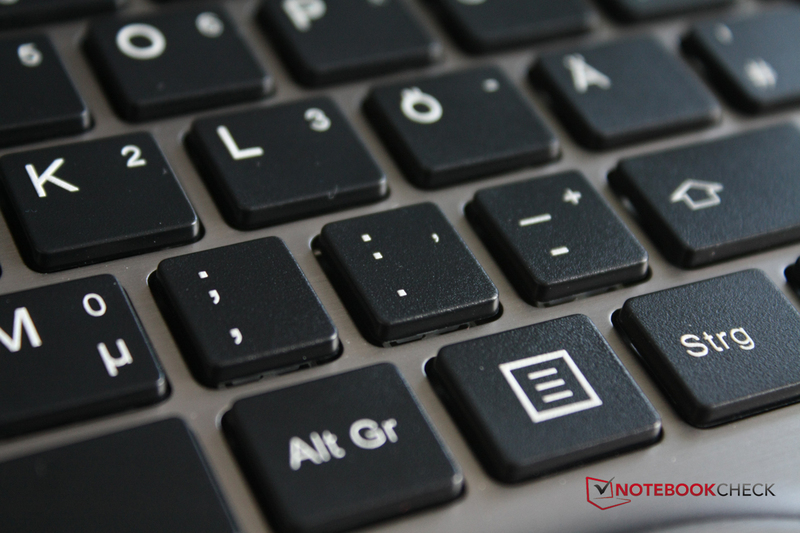 You can read more about notebook security in our FAQ article. The most outstanding accessory is definitely the digital pen that allows additional control options. It even comes with an additional battery, a wrist strap, and a holding clip. Fujitsu has also included a microfiber cleaning cloth. Other tablets with a glossy display might have needed such a cleaning cloth more, but it still remains a useful accessory. A carrying sleeve, which protects the tablet during transportation and comes as standard with other tablets, is only listed as an optional accessory on Fujitsu's website. 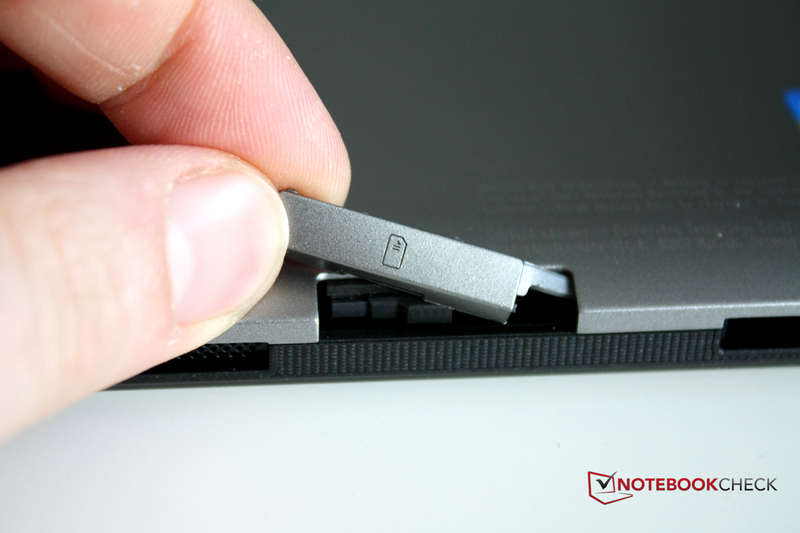 There the customer can also purchase a USB-to-LAN adapter so that connection between the tablet and the LAN without the keyboard dock is possible. 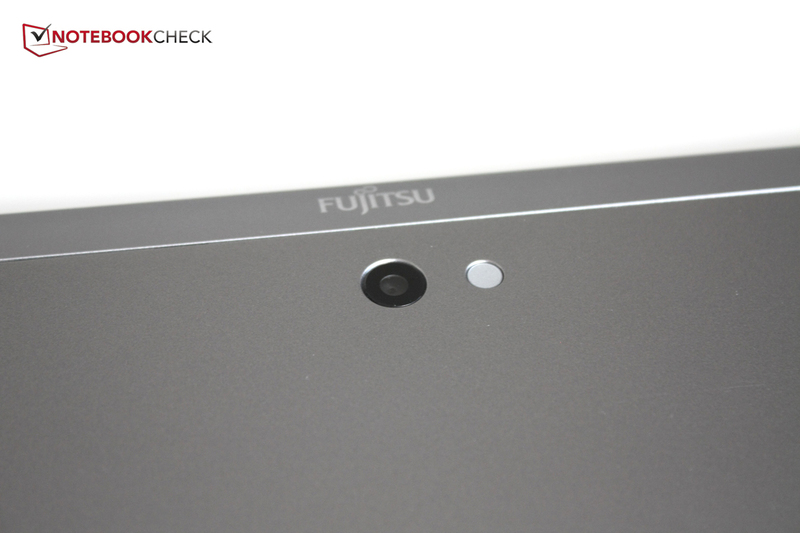 Fujitsu delivers the device with a 24-month warranty. If that is not enough, the manufacturer also offers a wide range of service packages from simple extended warranties and 24/7 service up to the option to keep the hard drives of defective systems in the company. 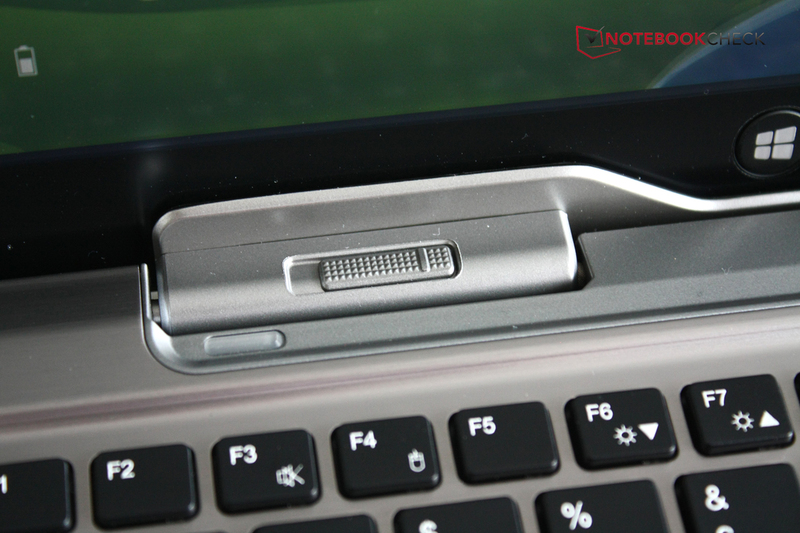 The keyboard in the included docking station is composed of individual keys in the so-called chiclet design. They are up to 15 mm wide (~0.59 inches) and the distance between each individual key is approximately 2 mm (~0.08 inches). Fingers are quite close to each other in the starting position for the standard 10-finger typing system. Still, we easily managed to type quickly and accurately. Some keys, such as the comma and point, are not at full width due to the small form factor. 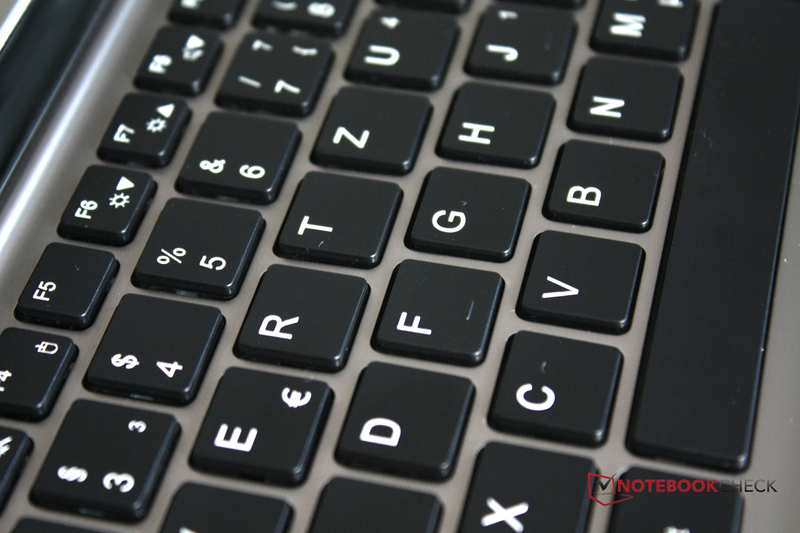 The pressure point of the keyboard is clear and we like the high-quality feel when typing. The stability plays a big part in this: nothing wobbles and the only drawback is the display hinge. When the lid is opened, the hinge protrudes backwards and raises the keyboard to a comfortable and ergonomic position. The problem here is that the dock's only support is in the middle, leaving the sides in the air and causing a bit of unnecessary wobbling. This irritated us now and then in everyday use. Fujitsu has added a "Menu" button in the bottom right of the keyboard that has a significance in Windows 8 - it opens the right-click menu. Otherwise, it requires the use of the touchpad or a mouse and on the touchscreen it is accessed via holding and pulling down the application button. A nice gimmick. 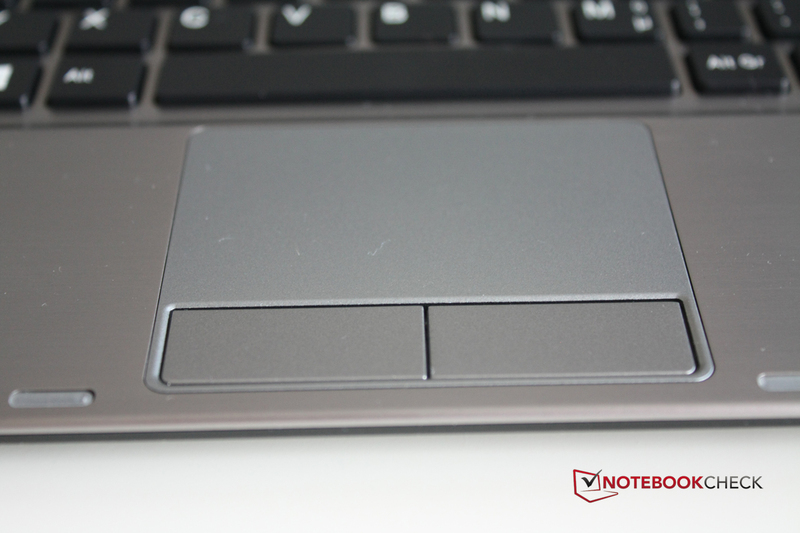 The touchpad is not very large, but has separate buttons that work reliably and with a crisp tactile feedback. 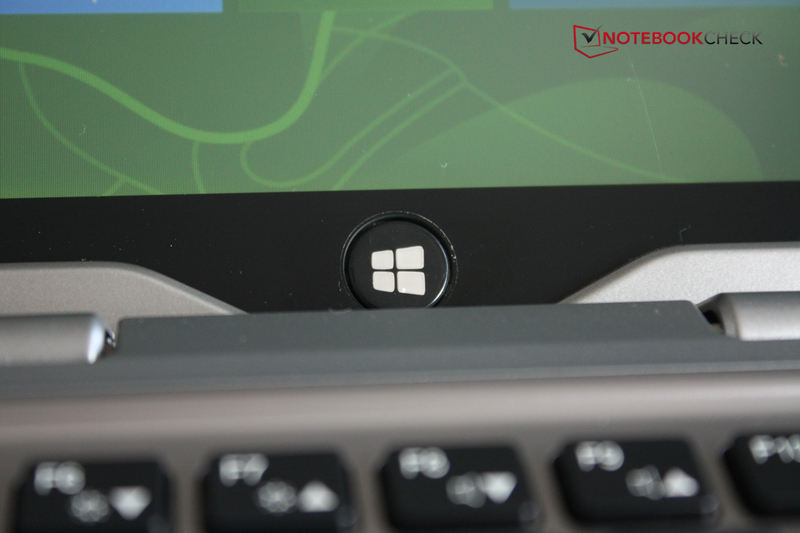 The surface of the touchpad is smooth, but you will still need to glide your finger a couple of times to move the cursor across the screen. Overall, work with the touchpad is easy, although it could have been a bit larger. In addition, there is no support for multi-touch gestures. The touchscreen can be operated with fingers or with the supplied digital pen. Both work great while the tablet is on the table. When the tablet is docked to the keyboard, finger input still works well and the screen is held firmly, without the insecurity of tipping over. The pen is difficult to use when the tablet is vertically positioned. First off, the user's arm is always on the touchpad and the keyboard and inadvertent inputs are likely. 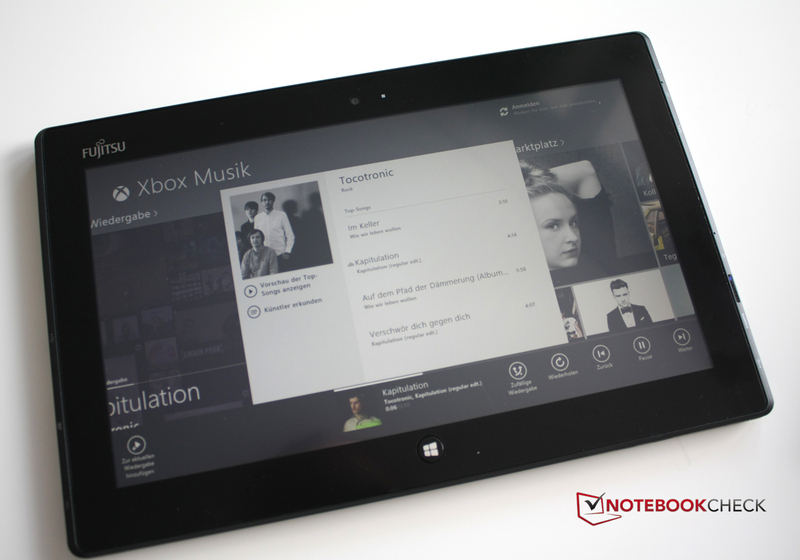 Secondly, the bottom of the screen is hard to reach and a scroll through the Windows 8 Apps is difficult to initiate. 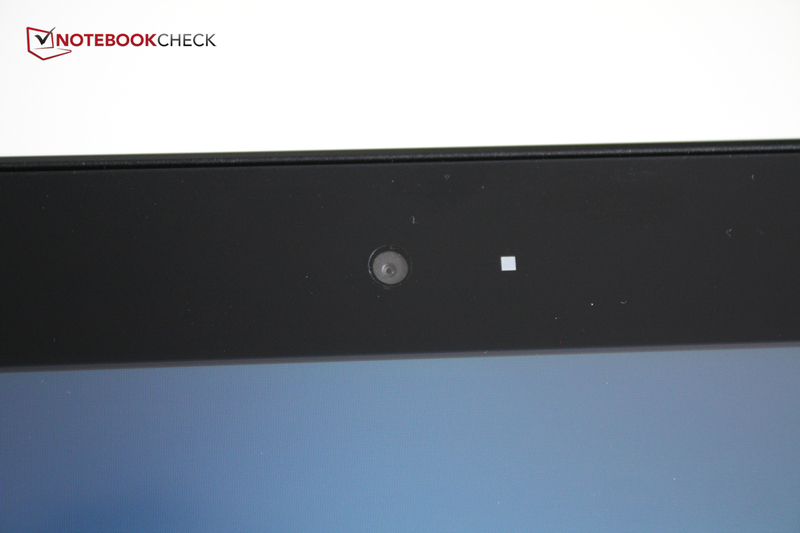 Thanks to the matte finish of the display, fingerprints and dust are hardly visible compared to a glossy tablet screen. Another advantage is the freedom to use either fingers or the pen in order to operate the tablet conveniently when docked. Decent screen brightness, non-glare display surface, IPS panel with stable viewing angles in all directions, and the standard resolution of 1366x768 pixels for an 11.6-inch display are all good so far, right? "Yes, but..." is the answer. 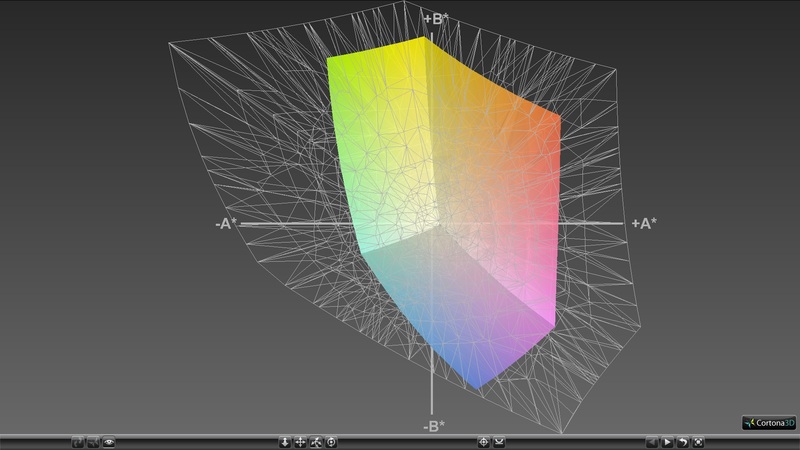 In reality, the measured values of the contrast and brightness are only acceptable. 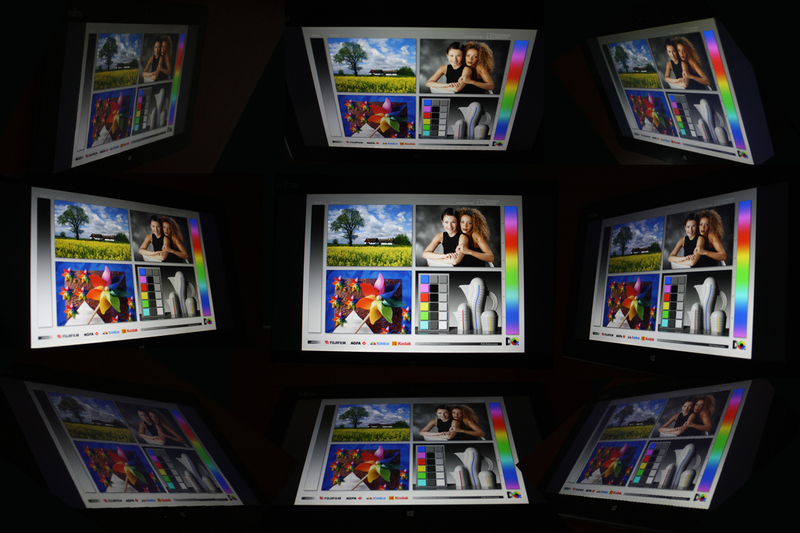 The maximum brightness of 330 cd/m² seems strangely subdued in comparison to other screens with similar values. The really colorful Windows 8 looks very bleak and the overall picture seems almost blurred. Fujitsu advertises the display as "non-glare", but to us it seems like it was a standard glossy tablet that was coated with a second matte layer. The result is somewhere between a glossy and a non-glare display, which has less reflections than a glossy screen, but more than a proper matte one. We have tested the display before and after calibration with a spectrophotometer (see the pictures). The gamma value is 1.8 at 10 percent brightness and 2.2 at maximum brightness. The color temperature is also dependent on the brightness and is between 6193 and 6514 K, which is mostly just below the ideal 6500 K. The blue and magenta are far out of target and that is evident in the color saturation. Both colors far exceed a DeltaE value of 5. This blue tint is a drawback of many displays. Overall, its effect is relatively minor. Only DeltaE values of 3 and more are visible to the naked eye. The grayscale comes relatively close with an average DeltaE value of 3.83. This is not particularly good in comparison to a desktop monitor, but it is better than most of our test devices (grayscale DeltaE of 10 to 20). The Fujitsu LifeBook T902 was a bit better in this area. 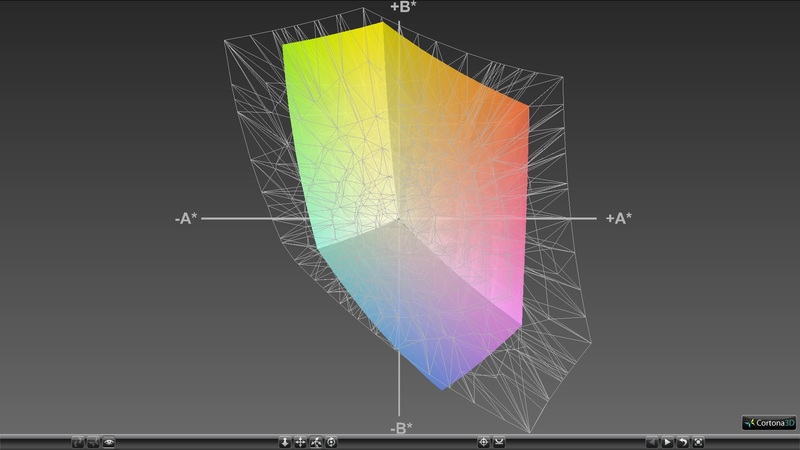 A good color reproduction is to be expected from a business device that costs a four-figure sum. This is something that is less relevant to everyday tasks, but makes life easier for photographers and video editors. The Fujitsu Stylistic Q702 is not really convincing here either. 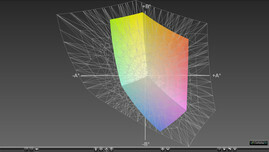 The Adobe RGB color space is not even close to being covered and the smaller sRGB is only covered to about 70%. The rivals' screens are better in some areas. 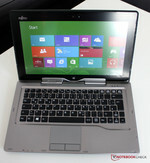 The Sony Vaio Duo has a Full HD display and the Asus Taichi 21 has better color reproduction. However, the competition uses almost exclusively glossy screens that have finer colors, but are also more reflective outdoors than the matte display of the Fujitsu Stylistic Q702. All in all, the display is not impressive - it has a blurry image, is hardly suitable for outdoor use despite its matte surface, and is just average in all other categories. 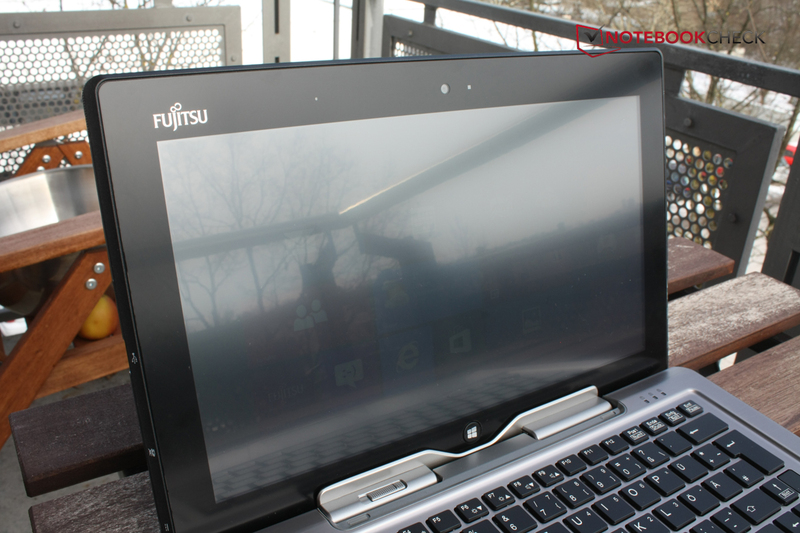 Even after leaving our test lab and going outside, the display of the Fujitsu Stylistic Q702 is still not convincing. 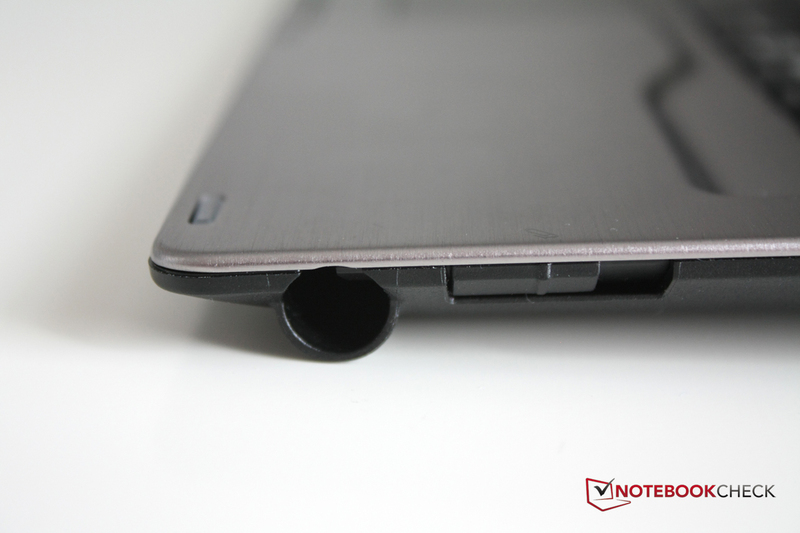 The matte surface and high brightness should easily allow working on a cloudy day. But this is not the case: the reflections are too much, and the brightness of the display cannot counteract them. A light sensor automatically adjusts the screen brightness in all situations, but we manually set the brightness at maximum for our field test. The viewing angles are also limited due to the additional coating, even though the IPS panel could have provided a stable picture. The screen becomes completely unreadable at angles exceeding 70° in any direction. This is not necessarily a drawback for the business users - sometimes it is even an advantage that the person in the seat next to you on the plane cannot read the sensitive data on your screen. However, since Fujitsu has not advertised this as a feature, we assume that the display was not deliberately designed for this. Fujitsu offers the Stylistic Q702 with Core i3 and Core i5 processors. 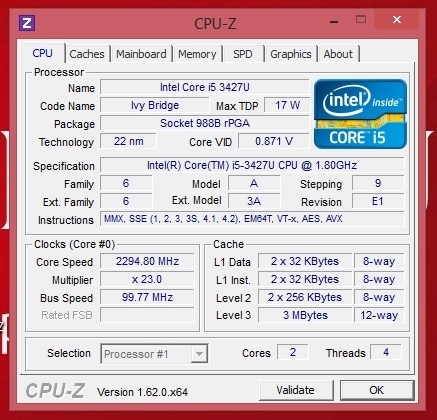 The heart of our test model is an Intel Core i5-3427U, which is found mostly in ultrabooks and other small systems due to its low TDP of only 17 W.
The processor is based on the current Ivy Bridge architecture and features the Turbo Boost 2.0 technology, which raises the frequency of one or all cores when needed. 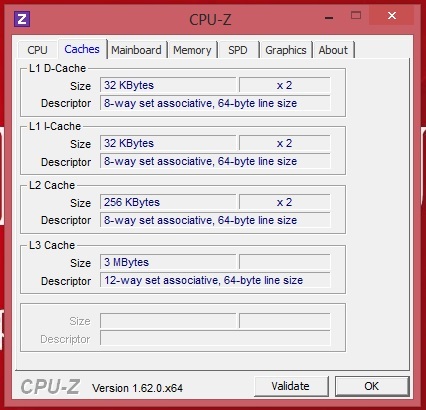 The base frequency of the CPU is 1.8 GHz, but that can be increased to 2.6 GHz for one core and 2.8 GHz for two cores, in order to provide higher performance. The system is equipped with the maximum 4 GB of DDR3 system memory. The 128 GB SSD by Samsung can be upgraded to a 256 GB model. We measure the performance of the processor with the Cinebench program and at the same time observe how well the system uses the Turbo Boost. 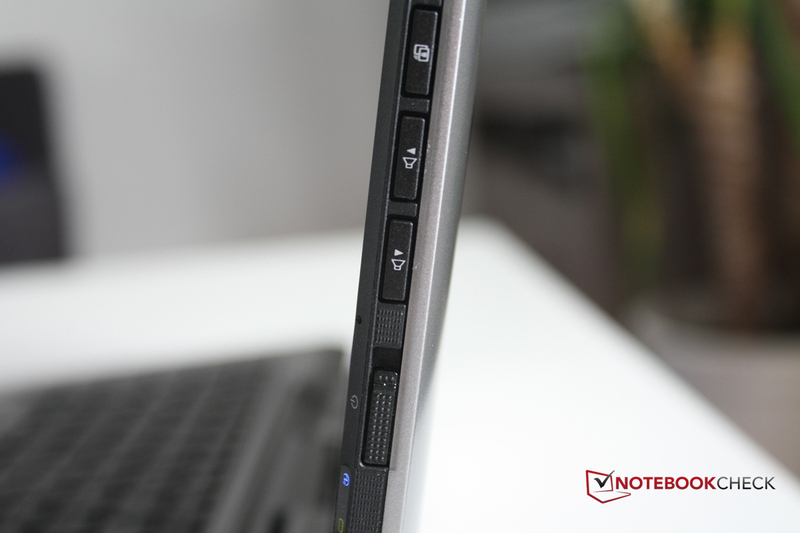 Our test model is equipped with a slightly faster CPU than the rivals Sony Vaio Duo and Lenovo ThinkPad Twist. Despite this, our system is surprisingly far behind - it is 30-60% slower than the Sony and the Lenovo. 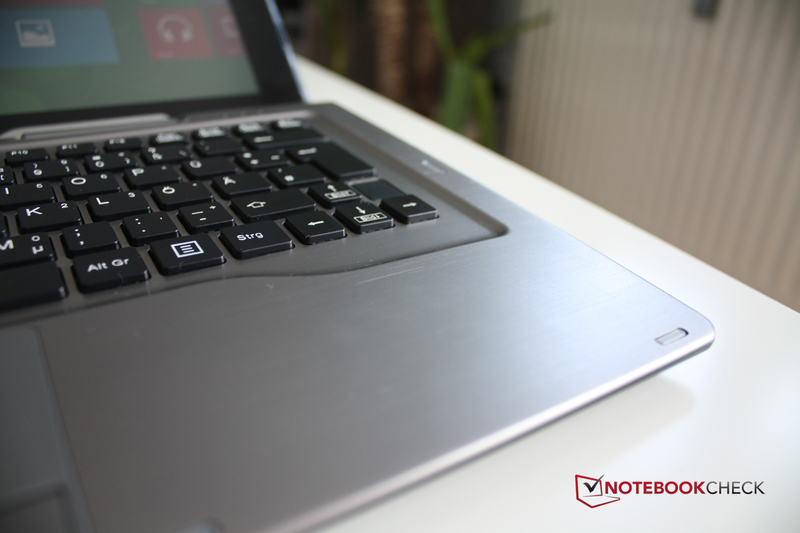 Since we thought this was highly unlikely, we repeated the test and came to the same conclusion: the Fujitsu notebook is simply slower than its rivals. 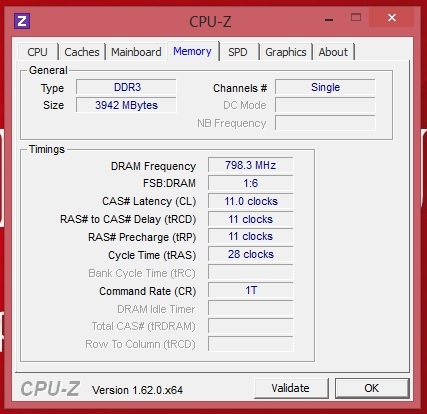 A look at the processor frequency quickly reveals the reason for this performance limitation. 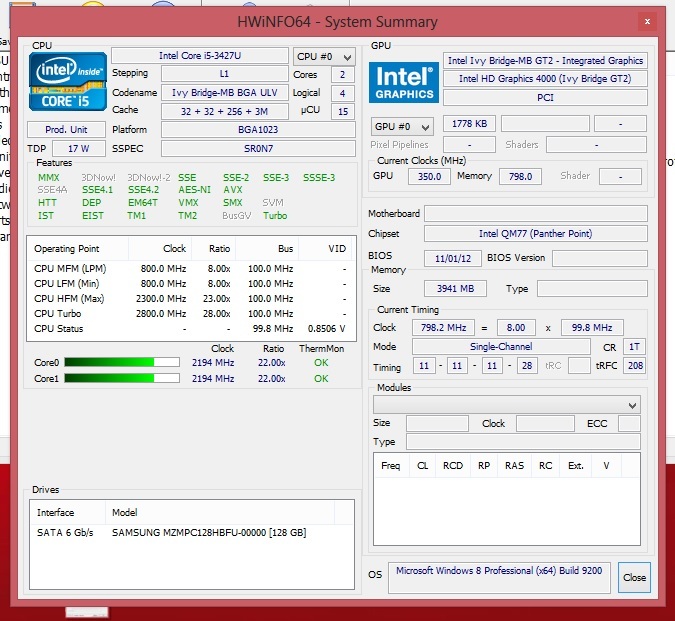 Under load, the processor is downclocked instead of being overclocked by Turbo Boost. Presumably, the cooling in the tight casing is not very good and the processor lowers its clock in order not to overheat. We already observed the same throttling in Samsung's Series 7 XE700T1A-H01DE. 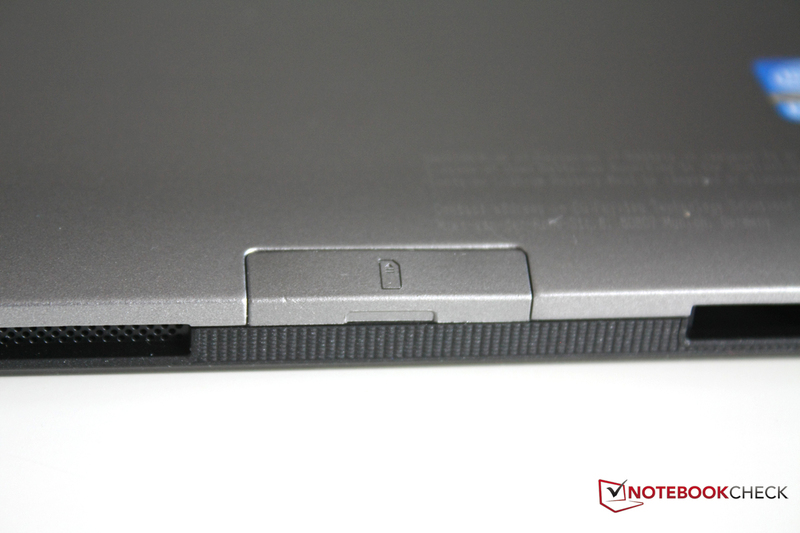 Sony and Lenovo have more room for the components and their cooling due to the non-removable screens. 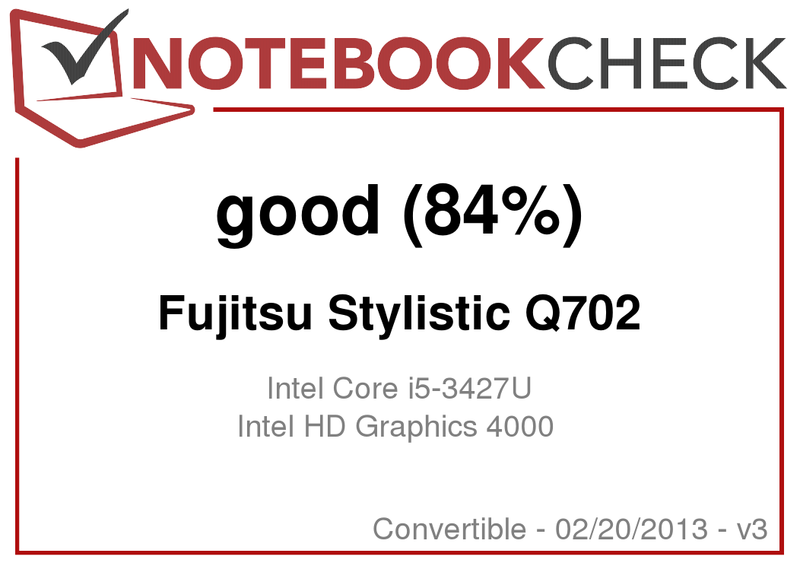 The Fujitsu Stylistic Q702 is certainly powerful for a tablet, but such a big performance drop at this high price is not a good selling point against the other convertibles and ultrabooks. 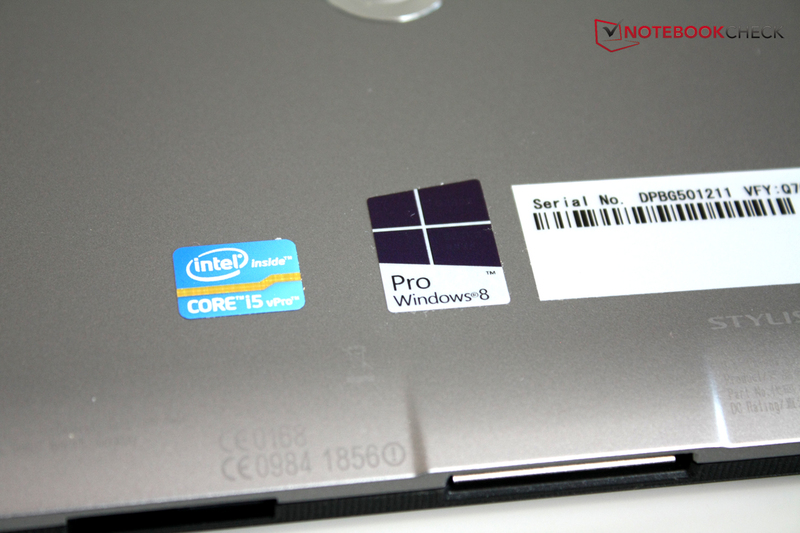 Windows 8 has awarded our test model with a performance index of 4.4 points, the same as Lenovo's ThinkPad Twist. In this discipline both of these are behind the Sony Vaio Duo with its 5.5 points. PC Mark 7 also shows a difference. The Fujitsu Stylistic Q702 with its SSD is a good 400 points (13%) ahead of the Lenovo. 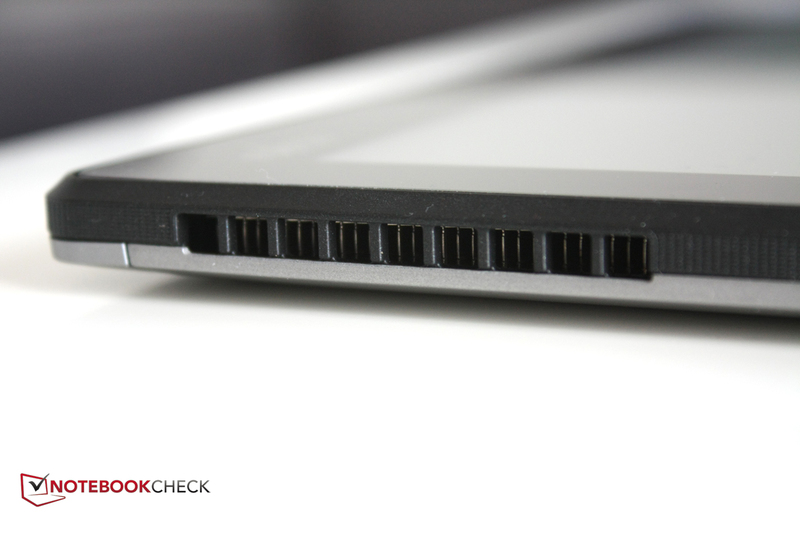 Sony's laptop reaches 1400 points, which is due to the fast SSD and better use of the Turbo Boost technology. What does this mean in practice? There is hardly any delay in everyday use with office programs, Internet browsing, less demanding photo editing, and HD video playback. The performance limits are reached only when you load the Fujitsu Stylistic Q702 with more demanding tasks such as video editing, high-quality image processing or gaming. But then again, it is significantly faster than comparable devices. In terms of storage, Fujitsu has not cut any corners and has installed the Samsung MZMPC128HBFU model, which belongs to the known and esteemed Samsung SSD 830 Series. 128 GB is the SSD's capacity. A recovery partition is not needed because a recovery disk is supplied. Nevertheless, Fujitsu has reserved 15 GB for this purpose on the SSD. Therefore, you have to first format the drive in order to access the full 128 GB. The premium Samsung drive has excellent access times and read and write rates, which are on par with the Sony Vaio Duo that has an SSD by Toshiba. Only the mSATA port being used diminishes the performance a bit. A 2.5" Samsung SSD 830 Series with SATA3 would have been faster. The Lenovo ThinkPad Twist with its conventional hard disk cannot keep up. The integrated graphics chip Intel HD Graphics 4000 also has a Turbo functionality, which can increase the base clock frequency of 650 MHz up to 1050 MHz. Under low load, it can be reduced to 350 MHz in order to lower the power consumption. As you probably already guessed, the graphics card in the Fujitsu Stylistic Q702 makes no attempt to reach its maximum frequency under full load. In addition, only one RAM module is installed, which means that the fast Dual Channel mode cannot be used. The system memory slows down the graphics chip, because the Intel HD Graphics 4000 shares the available RAM and here there are only 4 GB installed. This is reflected not only in the synthetic 3DMark06, where our test unit is 50% slower than Sony's Vaio Duo with the same card, but also in games, as we will shortly see. Although the combination of Intel Core i5-3427U and Intel HD Graphics 4000 actually suffices for playing games in low to medium details, our test system is less than convincing because of the under-utilized Turbo Boost. Only extremely undemanding games, such as FIFA 13, can be played in high details and resolution. Demanding games like Mass Effect 3 are not enjoyable at all. Sony and Lenovo perform much better in this area. Those who want to occasionally play games should therefore opt for a convertible concept that has enough cooling reserve to fully utilize the Turbo. Still, the Fujitsu Stylistic Q702 offers enough performance for casual games. We tested this by downloading Angry Birds: Star Wars from the Windows App Store and it ran smoothly. 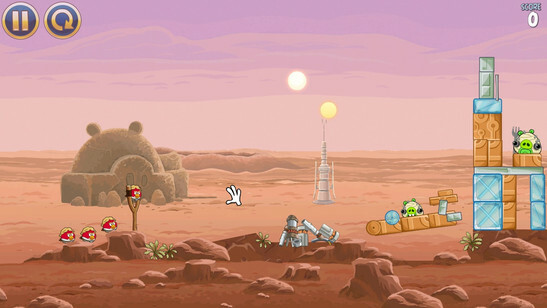 Only casual games such as Angry Birds: Star Wars run smoothly on the device. We cannot really fault the Fujitsu Stylistic Q702 in this category. The fan is never entirely turned off, but it is barely audible. In idle state, we measured a maximum of 30.4 dB (A). The fan gets a bit louder under load - 37.7 dB (A) on average with a maximum of 40.1 dB (A), which is clearly audible. While there certainly are louder devices, the fact that the fan of the Fujitsu takes a very long time before it spins down to its idle state is very annoying. Even a few minutes after the stress test, the fan is still clearly audible as it slows down. Overall, the rivals from Sony and Lenovo are similarly loud. The competitor from Samsung is already a year old and is quieter due to its weaker components. In terms of heat generation, the tablet remains in the moderate range. The area of the fan is of course the hottest spot on the tablet. We measured 34.2 oC (93.56 oF) in idle state and 42.6 oC (108.68 oF) during the stress test on this spot. 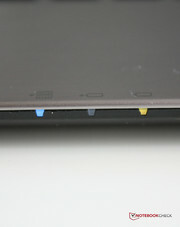 The air outlet is well positioned in the upper half of the tablet, where the device is not being held. This keeps the hands cool since the bottom area of the tablet heats up the least. Traditionally, speakers are rarely used on business devices and therefore are not the focus of developers. The Fujitsu Stylistic Q702 has two stereo speakers on the bottom edge. This proved to be a well-chosen spot, because you do not cover the openings with your hands while holding the tablet and when it is docked to the keyboard, the raised hinge holds it a few centimeters above the desk. The sound is clear and without distortion even at maximum volume. Bass is completely lacking and the sound is high-heavy. Although listening to music is not really enjoyable, the speakers are enough to watch the occasional video with colleagues. The output of the audio jack is flawless and with appropriate headphones a very good sound is possible. The Fujitsu Q702 offers considerably less performance than its competitors offer and therefore should at least have a significantly lower energy consumption as well. In terms of minimum power consumption, the Sony is superior - it needs only 5.4 W. The Stylistic Q702 draws almost twice as much energy - 12.3 W. When the pre-installed Fujitsu Eco Profile is used, the consumption can be reduced down to 10 W.
Only when it comes to maximum power consumption can the Fujitsu turn its lack of power into an advantage. The absolute maximum is 24.1 W, whereas Sony's Vaio Duo consumes more than 40 W, but also occasionally delivers almost twice the performance. The power supply of the Fujitsu Stylistic Q702 could easily handle these 40 W. We must also note here the high-energy consumption when the tablet is off. The Fujitsu Convertible draws 0.4 W when it is completely turned off and it even consumes 0.6 W in the energy-saving mode. Many of the rival devices have significantly lower power consumption here. The consumption of the Sony even comes close to zero. In our test under minimum load, which is reading a text with lowered screen brightness and deactivated wireless modules, we managed to achieve the exact maximum runtime that Fujitsu advertises - 571 minutes, meaning almost 9:30 hours. This excellent value is of course due to the fact that Fujitsu has installed a 34 Wh battery in the tablet and a second 45 Wh one in the keyboard dock, which more than doubles the runtimes. 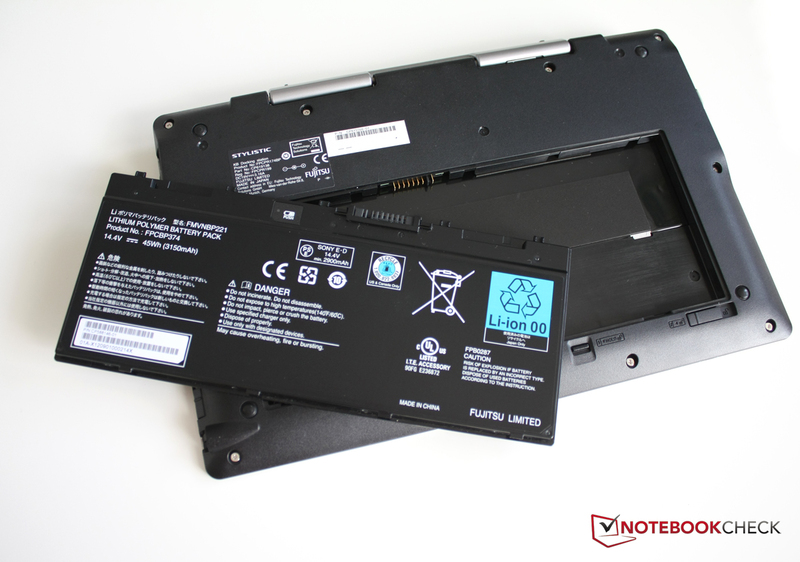 The battery in the tablet is charged first and then the one in the keyboard dock. This way the tablet is always ready for mobile use. Under maximum load, the battery was empty after 3:20 hours. The practical test, which is Internet browsing over WLAN, finished with a result in the middle of the two extreme values, as was expected. All in all, the very long battery life is one of the strongest points of the Fujitsu Stylistic Q702. However, we must note here that, due to the powerful components and weak battery, the tablet can only manage about 40% of these runtimes when used without the keyboard dock. The Fujitsu Q702 is a good example of why there are not many full-fledged business tablets with a keyboard dock - compromises have to be made and the full potential of the components cannot be utilized due to the limited space in the casing. In addition, there is the high price. 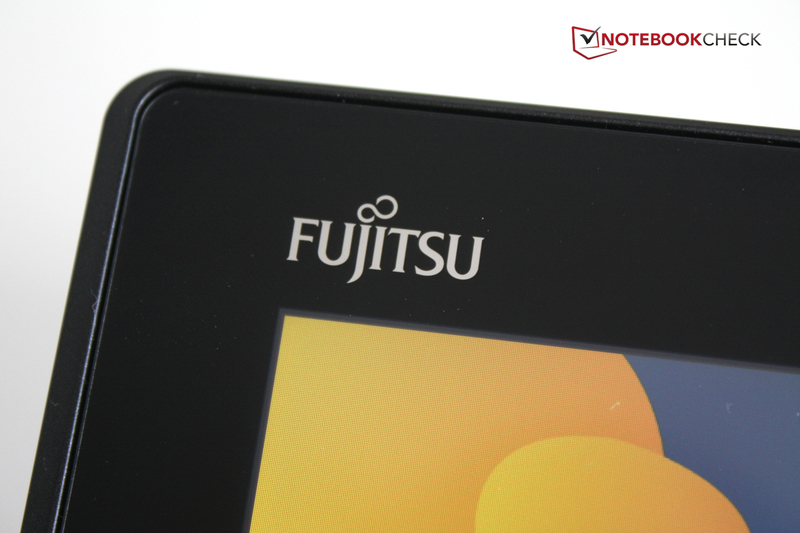 The Fujitsu Q702 is surely one of the most powerful Windows 8 tablets on the market, but in the business sector it must compete against convertibles and ultrabooks that are almost as mobile as the tablet, but are lighter and less bulky. But what are the advantages? These are the high-quality materials used, complete interface package with numerous ports, two webcams, comprehensive security and manageability features, a lot of accessories, a fast SSD, and all the input options that the current PC technology has to offer, which include touchscreen, touchpad and digital pen. In addition, there is the very long battery life thanks to the second battery integrated in the keyboard dock. The weaknesses of the concept are also immediately noticeable. Above all is the poor performance, due to the bad cooling in the casing. Therefore, the customer pays for powerful components, whose full potential cannot be used. There is also the fan, which is sometimes hardly audible, but often runs at full speed for a prolonged time after the tablet has been under heavy load. The display cannot be changed and although it has a matte surface and an IPS panel, it disappoints with a low outdoor suitability, pale colors, and slightly limited viewing angles. 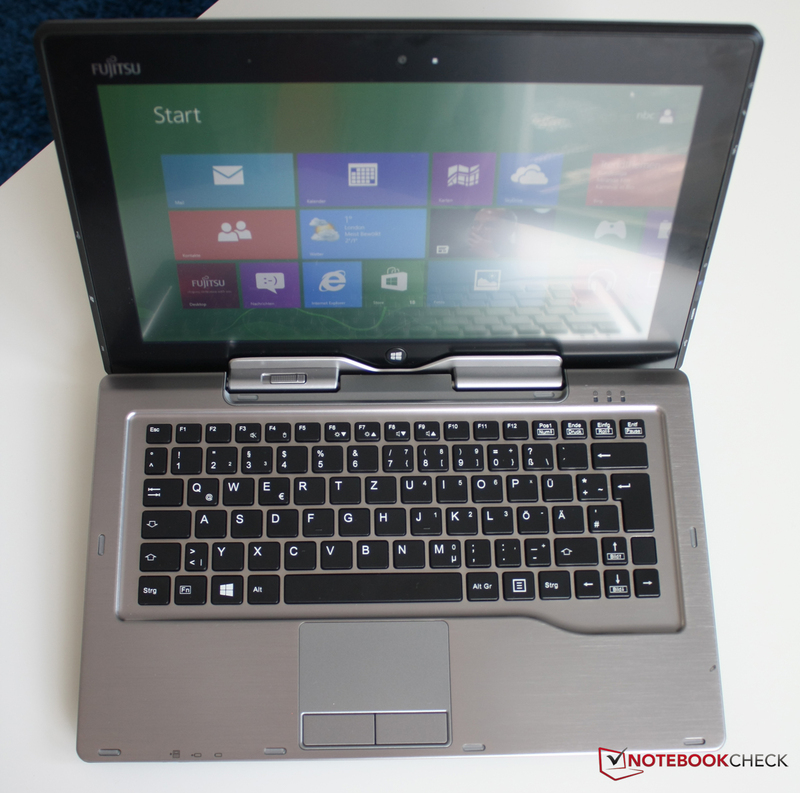 Overall, the Fujitsu Stylistic Q702 will not pull the professional tablets out of their niche. There are simply too many weaknesses at too high of a price. 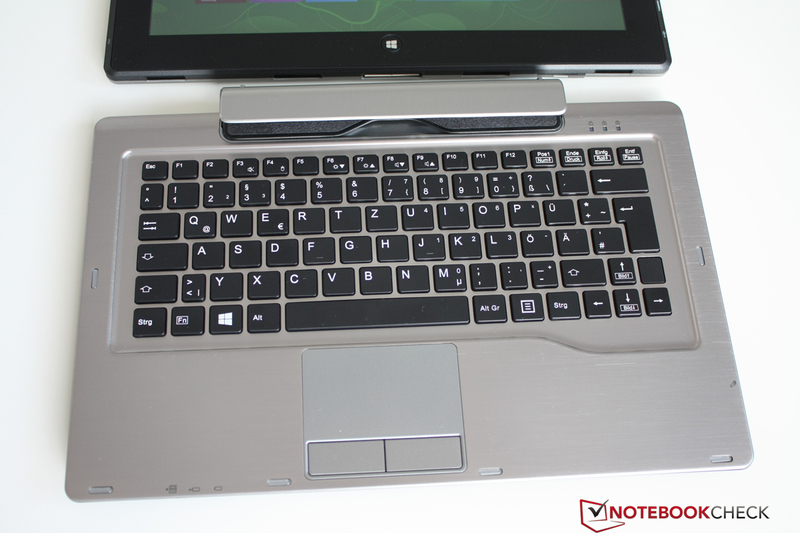 There are convertibles with fixed screens, such as the Sony Vaio Duo or the Lenovo ThinkPad Twist, which offer a more complete package with higher performance at similar or even lower prices. The Fujitsu Stylistic Q702 is mainly for those who would put value on the long battery life, the tablet form factor with numerous interfaces and the availability of the digital pen. Office tablet, convertible, and ultrabook with a removable display? Windows 8 Pro is perfect for touch control. Security is an important feature for an office device: there are a fingerprint scanner, software and built-in administrative functions. Also very important for the business users is the mobile Internet access. The Fujitsu Stylistic Q702 has a WWAN module, with optional 4G. Very good if you travel a lot is the second battery in the keyboard dock, which extended the runtime to 9:30 hours. ...although some keys are bit small. The touchpad is also small, but sill good. We also liked the hardware buttons for volume, wireless and positioning sensor on the tablet. LEDs on the keyboard dock inform of the battery charging and operation status. All the performance relevant components are in the tablet itself, but they are insufficiently cooled. The Intel Core i5 cannot reach its full potential. The speakers are fine and have a high maximum volume. The digital pen even has a designated storage bay. The touchscreen can be controlled via fingers or with the digital pen, but the panel is definitely not the highlight of the tablet. It is hard to define exactly what the Fujitsu Stylistic Q702 is. ...or can be docked into the keyboard. You just click the tablet in place. To release, just push the switch to the left and remove the tablet. Fujitsu has used high-quality materials for the casing. However, the magnesium display lid can be slightly dented. The keyboard frame and palm rest are made of aluminum. There is also a lot of black plastic, which Fujitsu has used for some nice design details. 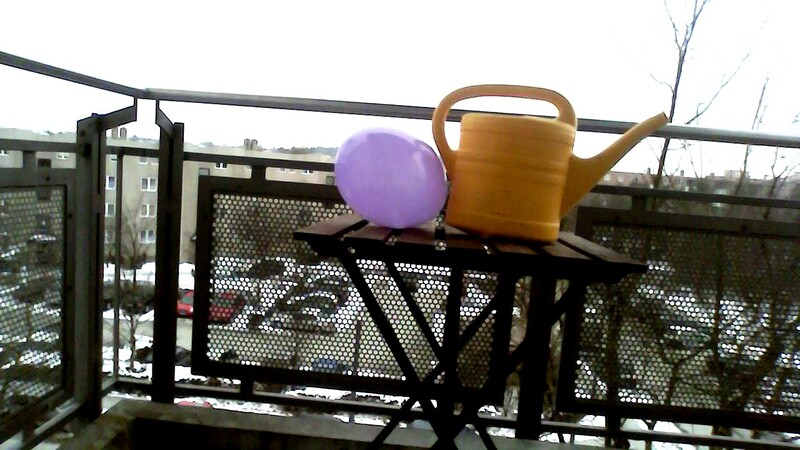 ...and one with 0.3 megapixels and poor quality. Otherwise there are a lot of accessories and software disks. However, they lack both bass and mids. - ... but without utilizing the full capabilities of the components. 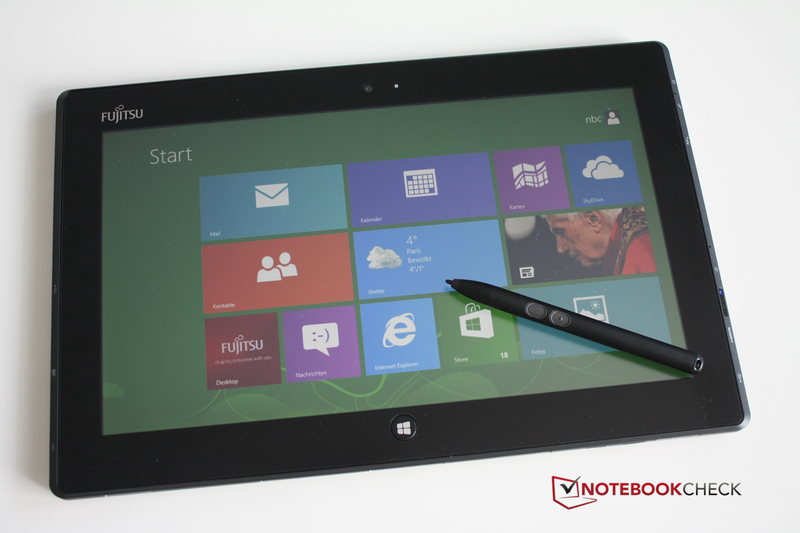 Fujitsu offers a powerful tablet with numerous interfaces. 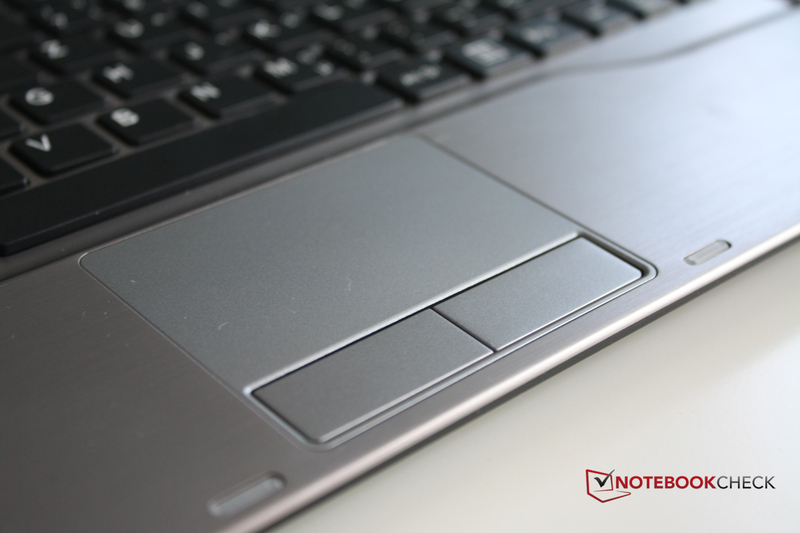 A better screen, more uniform materials, and a larger touchpad with multi-touch support. How little was achieved with the good components and display.